Audi Sport Team ABT Sportsline has announced their driver line-up for the 2010 DTM season today. Changes include Miguel Molina and Oliver Jarvis replacing Tom Kristensen and Katherine Legge. Making his four-ringed debut, 21 year-old Molina becomes Audi's youngest "factory" driver. Full press release after the jump. Miguel Molina and Oliver Jarvis will replace Tom Kristensen and Katherine Legge in Audi Sport Team Abt Sportsline. At age 21, the Spaniard who hails from Girona near Barcelona is the youngest Audi "factory" driver. After exclusively racing Formula cars so far, he will now compete with a roof above his head for the first time. "For me, a dream is coming true," says Molina. "Driving for Audi in the DTM is simply fantastic. 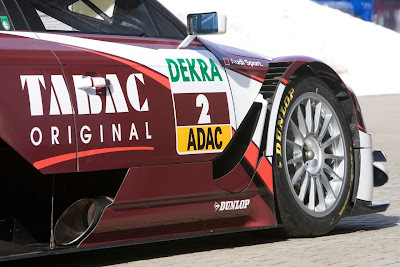 Audi is a fascinating brand with superb cars and the DTM has proven to be one of the world’s toughest racing series. I’ll give everything to live up to the expectations placed on me." Molina could hardly have wished for a better team in his DTM debut season: like the title defender Timo Scheider, the two-time DTM champion Mattias Ekström, the four-time DTM race winner Martin Tomczyk and the up-and-coming driver Oliver Jarvis, the young Spaniard will compete for Audi Sport Team Abt Sportsline, the team that provided the DTM champion in the three most recent consecutive seasons and, in addition to four current-specification Audi A4 DTM cars (internal designation: "R14 plus"), will again enter a fifth car from the previous model year ("R14") in 2010. "Withe the new guys we can trust on a strong team again", says team boss Hans-Jürgen Abt. "Although Tom Kristensen left a huge gap in the team, our young Brit will give everything to show a great performance." Katherine Legge, who contested the series for Audi Sport Team Abt Sportsline in 2009, will switch to Audi Sport Team Rosberg to become Markus Winkelhock’s new team-mate. "With her strong ambition and her great character, Katherine was a valuable addition to our team. We will keep our fingers crossed for her and I'm sure we will stay good friends anyway."